12/8/2009Share this story on Facebook! 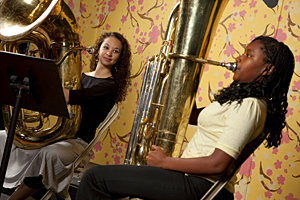 Recent IC music education alumni share a little bit about what they’re doing. What she’s doing now: Teaching elementary general music and middle school chorus in her hometown of Stoughton, Massachusetts. What he’s doing now: At Florida State University, working on a Ph.D. in music education and wind conducting. What she’s doing now: Working on her master’s in music education at Ithaca. Teaching elementary school students general music, conducting two choral ensembles, directing after-school vocal programs, and serving as vocal coach for the school musical in Vestal, New York. Giving private voice and piano lessons. Was a guest conductor for a high school workshop in Quincy, Massachusetts. One hundred percent of IC music education graduates who actively seek a teaching position find one, and they also have a strong record of being accepted into major graduate programs. In room 203, Daniel Mahoney ’11 and Caitlin Henning ’11 try to get their fifth and sixth grade guitar students to make a smooth transition from a C chord to an F.
Of the many music education partnerships Ithaca has with other schools, the relationship with Immaculate Conception is the longest-standing, going back to 1946, when the two schools were just a few blocks away from each other. And unlike other area schools where IC students contribute to the music program, at Immaculate Conception these students are the music program. Associate professor Jennifer Haywood ’94, who was once a student teacher and then a graduate mentor at Immaculate Conception, now oversees the program. What she liked about it then -- “the opportunity as an undergraduate to fully experience singing, conducting, and teaching with equal opportunity for scholarship and artistry” -- still applies today. Kimball, though only a month into his Immaculate Conception teaching, agrees. Cruz says his first teaching experience -- with fifth and sixth graders -- was “nerve-racking.” In the end, though, he was impressed with his students and his efforts as a teacher. 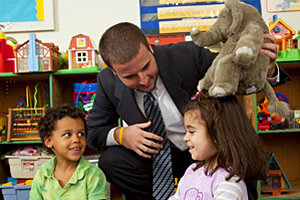 The first two years are dedicated to foundational study. Freshmen and sophomores also take Music Field Experience courses to observe teachers. Then as juniors, the real fun begins -- fieldwork. It’s Tuesday at 11:00 a.m., so the third-floor lobby of the Whalen Music Center is rapidly filling with IC music education students. Some are carrying two or three instrument cases; others have posters they’ll use as teaching aids. They look more like young professionals than college students: no jeans, no T-shirts, no baseball caps, no flip-flops. The men are in coat and tie; the women in dresses, skirts, or dress pants. As teachers, they need to look the part. A different group of students will head down to Immaculate Conception today, while others head off to four different elementary and middle schools across the county to give one-on-one instrumental lessons. 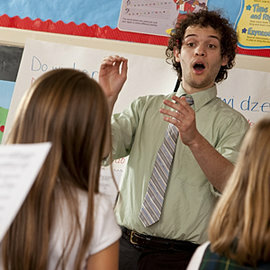 By senior year, when IC student teachers have to lead classes without the benefit of daily on-site supervision and mentoring by College faculty, students from most music programs are in front of a classroom for the first time. But for Ithaca seniors, whose placements span the state from outside Buffalo to Long Island, running a class is old hat. This year, Cruz starts an internship at Beverly J. Martin Elementary School in Ithaca, teaching second through fifth grade music classes, and he feels more than prepared. This intense preparation pays off: While many music education majors continue on to master’s programs, every single one who’s actively looked for a job teaching music has found employment within a year of graduating from IC.